Many educators have the misconception that makerspace activities always need to involve expensive technology like 3-D printers and circuit kits. But this isn’t true. 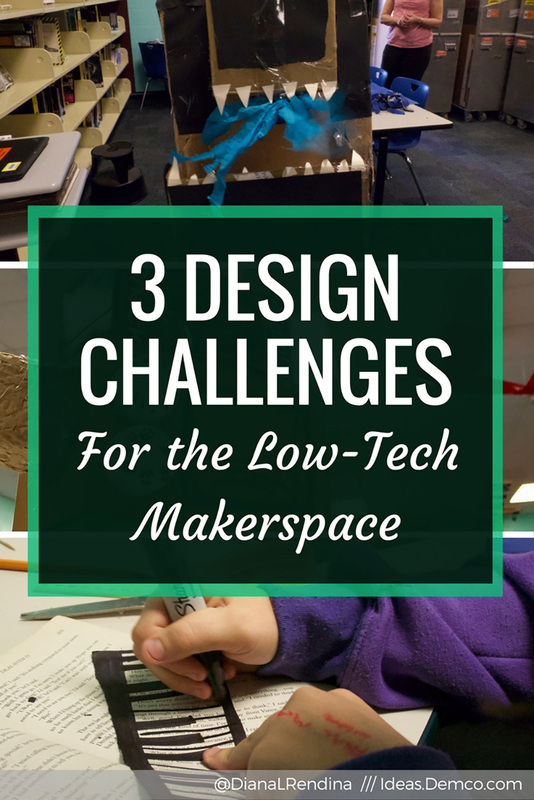 Students can have amazing learning experiences in makerspaces with low-tech and no-tech tools. 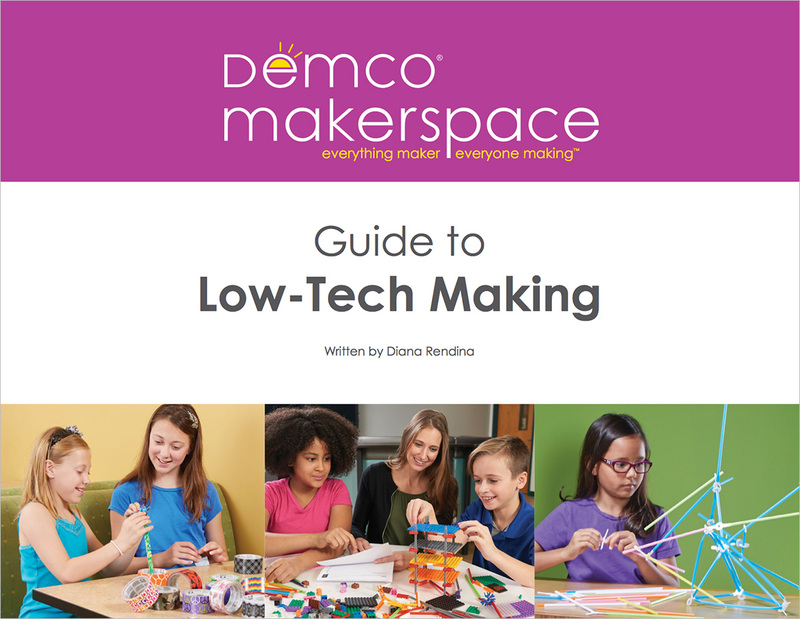 Heather Lister shared many such tools in her post on low-tech makerspaces. Once you have those low-tech tools in your makerspace, it can sometimes be tricky to figure out how to engage students with them. Enter: design challenges. 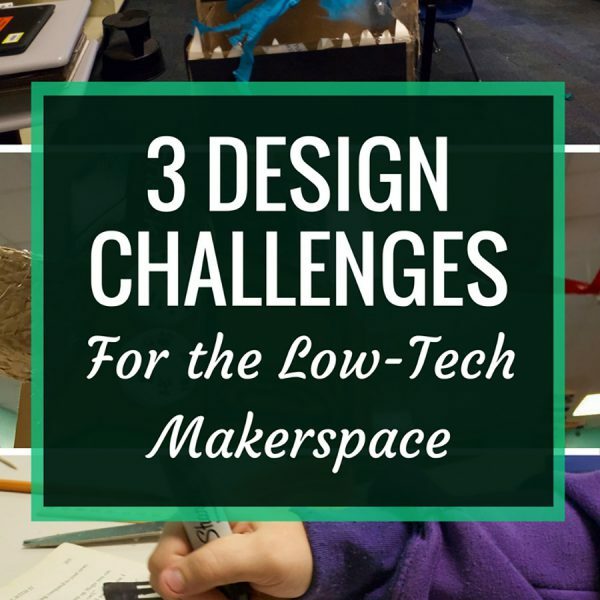 In Challenge-Based Learning in the School Library Makerspace (available for pre-order now), Colleen Graves, Aaron Graves and I share strategies for creating design challenges in your makerspace that will engage your students in creativity and innovation. For this post, I’ve used our design prompt template to share several design challenge ideas that work great with low-tech and no-tech tools. I come from a middle school background, but these challenges can easily be adapted for both elementary and high school. The Cardboard Challenge has long been one of my favorite makerspace activities. Inspired by the amazing short film Caine’s Arcade and the Imagination Foundation’s Global Cardboard Challenge, I create a new variation on this challenge every year. 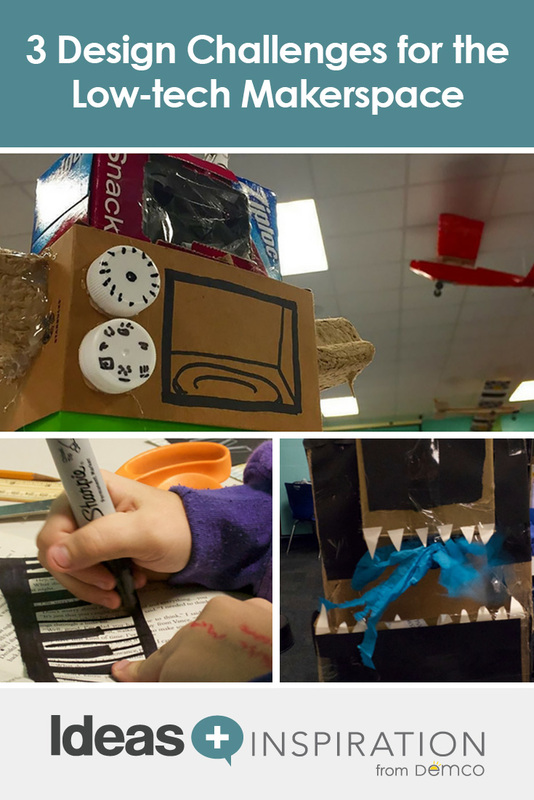 We’ve created cardboard arcades, robots, buildings, etc. 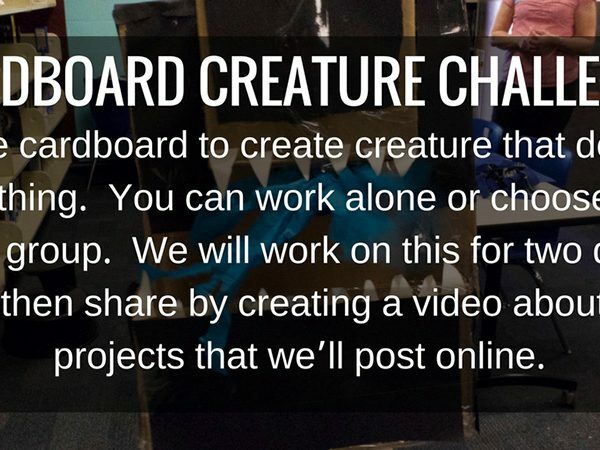 For this post, I’m combining the Cardboard Challenge with another of my students’ favorite challenges, the Creature Challenge. I’ve designed this one to last for two days, but you could make it longer or shorter as needed. I prefer to go for shorter time frames with cardboard challenges, mostly because it takes up lot of space to store student projects. Cardboard projects are very messy, but so worth it. Students get excited about bringing their ideas to life with materials they already have at home. Start your students off by watching Caine’s Arcade together. Explain how to safely use any supplies and materials you have available. Introduce the design prompt to students, and then watch the magic happen. 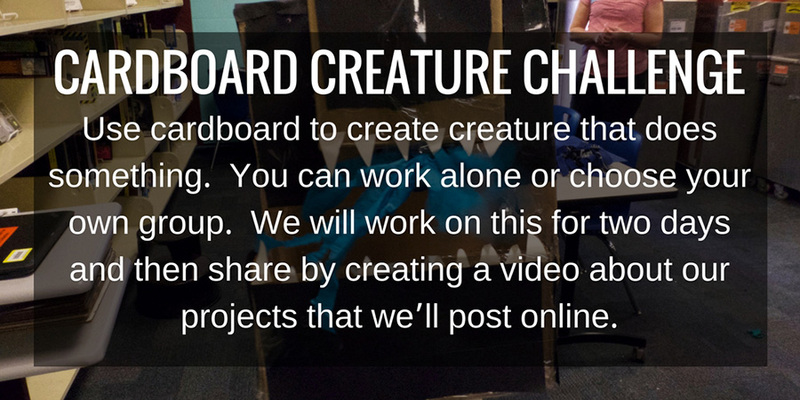 Design prompt: Use cardboard to create a creature that does something. You can work alone or choose your own group. We will work on this for two days and then share by creating a video about our projects that we’ll post online. Tech take-apart is a classic makerspace activity. This design challenge takes it a step further by recycling the technology into a robot made by students. This project doesn’t have to be super complex — picture a shoebox painted with black paint that has keyboard keys and circuit boards glued to it. Several different types of technology that are relatively easy to take apart. Think broken computers, keyboards, alarm clocks, etc. Safety goggles for students to wear to protect their eyes. An assortment of tools, such as screwdrivers, pliers, etc. For safety, cut off the power cords before allowing students to tackle the tech. Make sure to discuss how to safely take apart technology before letting students loose and set consequences for abusing the tools. The first session will be mostly taking apart the tech and salvaging pieces for the students’ designs. The second session will focus on brainstorming and creating their robots. 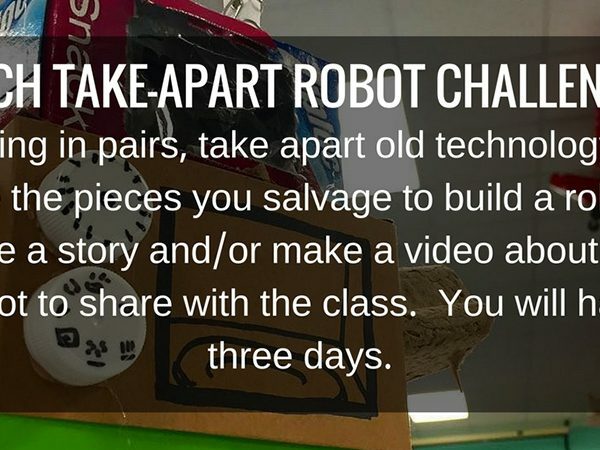 The final session will be where students can create the stories or videos about their robots. You can have students share their projects during this session or during a following session. 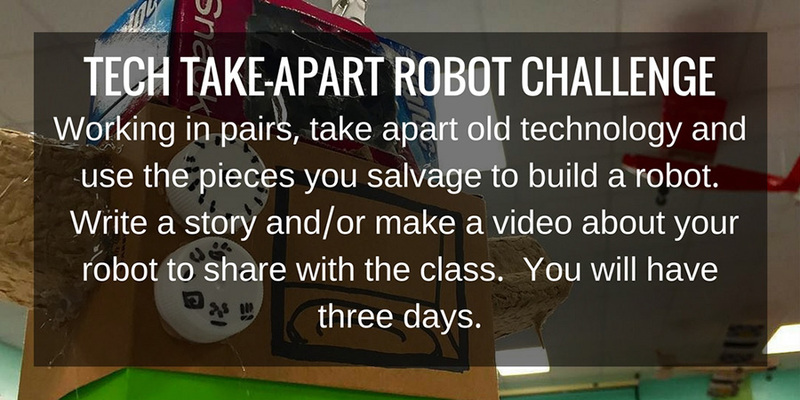 Design Prompt: Working in pairs, take apart old technology and use the pieces you salvage to build a robot. Write a story and/or make a video about your robot to share with the class. You will have three days. We all have damaged or out-of-date books that we’ve weeded from our library. Instead of tossing them out, why not transform them into recycled art? Browse Pinterest or check out some of the recommended resources below to gather inspiration for students. Provide students with a variety of arts and crafts supplies, including glue, tape, paint, scissors, glitter, etc. Teach the students about what an artist’s statement is, and have them write one up once their project is done. Then create a gallery of all the students’ projects in the library and invite classes to visit for a gallery walk. This is a great way to introduce students to the world of professional art and a fantastic way to recognize their work. 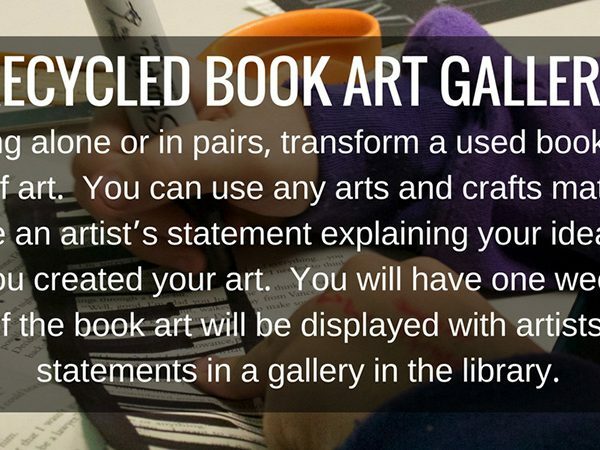 Design prompt: Working alone or in pairs, transform a used book into a work of art. You can use any arts and crafts materials, including paint, scissors, glue, tape, etc. Write an artist’s statement explaining how you came up with your idea and how you created your art. You will have one week to complete the project. 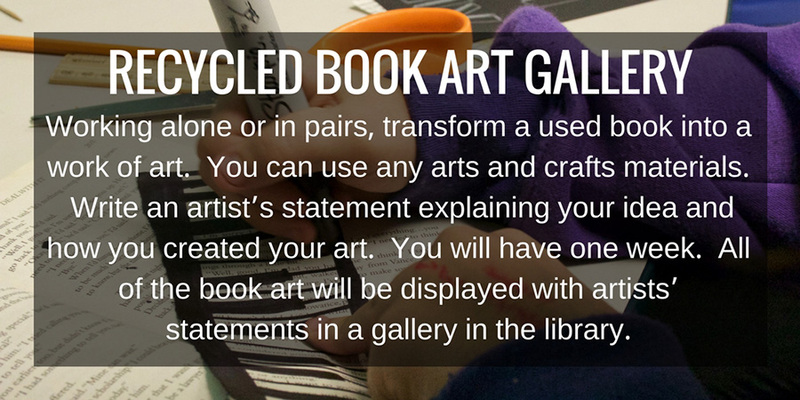 All of the book art will be displayed with artists’ statements in a gallery in the library.